I believe many have departed from their New Covenant vocation in Christ, having been vigorously beset and influenced by proponents of dubious ‘end times’ fiction. 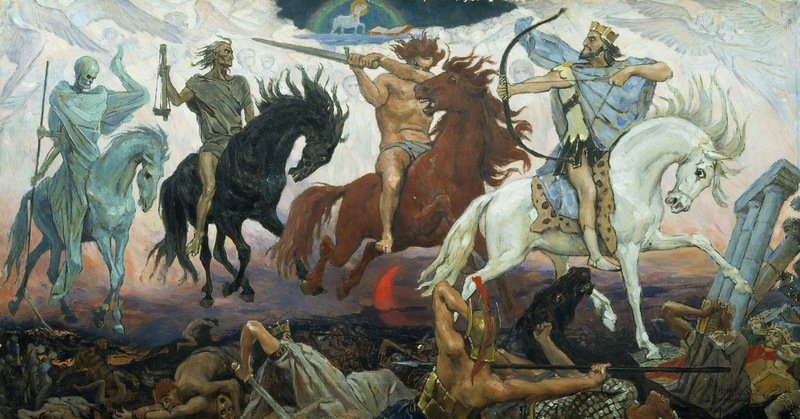 Today, our understanding of the ‘end times’ is invariably based on empirical evidence and current world affairs. Rev 21:22 KJV And I saw no temple therein: for the Lord God Almighty and the Lamb are the temple of it. There is also an ill-founded fascination amongst many believers concerning the building of a temple in Jerusalem, whether a ‘tribulation period temple’ or ‘Ezekiel’s millennium temple’. An underlying misconception is ‘the sooner a temple is in Jerusalem, the sooner Christ will return’. By comparison, the importance of the New Covenant temple is virtually inconsequential. Surely, zeal for the spiritual temple would be more profitable than ‘end times’ speculation. I will attempt to explain why I believe Ezekiel’s temple will never be built. Joh 4:21 KJV Jesus saith unto her, Woman, believe me, the hour cometh, when ye shall neither in this mountain, nor yet at Jerusalem, worship the Father. The Lord God Almighty and the Lamb Are the Temple! Rev 21:5 KJV And he that sat upon the throne said, Behold, I make all things new. And he said unto me, Write: for these words are true and faithful. Dispensationalism’s promulgation of a literal interpretation of Ezekiel’s ‘millennium’ temple is bewildering, incidentally, it includes the re-introduction of animal sacrifices, circumcision, the restoration of the Levitical priesthood, and the separation of Jew and Gentile. During Christ’s earthly ministry, He never mentioned a 1000 years reign on earth or Ezekiel’s temple. Why would members of the Royal Priesthood contemplate the proliferation of an ideology that supports the restoration of Old Covenant ordinances? It beggars belief that Christians would undermine all that Jesus made ‘new’ by advocating a thousand years of what was forever removed. Christ has fulfilled all the Law and the Prophets. He has made all things new. Jer 31:31-33 KJV Behold, the days come, saith the LORD, that I will make a new covenant with the house of Israel, and with the house of Judah: 32 Not according to the covenant that I made with their fathers in the day that I took them by the hand to bring them out of the land of Egypt; which my covenant they brake, although I was an husband unto them, saith the LORD: 33 But this shall be the covenant that I will make with the house of Israel; After those days, saith the LORD, I will put my law in their inward parts, and write it in their hearts; and will be their God, and they shall be my people. Jeremiah prophesied the establishment of the New Covenant, which would include a spiritual experience accessible to all who put their trust in Christ, whether Jew or Gentile. Eze 37:26 KJV Moreover I will make a covenant of peace with them; it shall be an everlasting covenant with them: and I will place them, and multiply them, and will set my sanctuary in the midst of them for evermore. Jesus fulfilled all the prophecies of Jeremiah and Ezekiel! Eze 37:27 KJV My tabernacle also shall be with them: yea, I will be their God, and they shall be my people. 2Co 6:16 KJV And what agreement hath the temple of God with idols? for ye are the temple of the living God; as God hath said, I will dwell in them, and walk in them; and I will be their God, and they shall be my people. ‘the temple of the living God’ Paul taught the fulfilment of Ezekiel 37:27 when he wrote to the Church at Corinth. 1Pe 2:5 KJV Ye also, as lively stones, are built up a spiritual house, an holy priesthood, to offer up spiritual sacrifices, acceptable to God by Jesus Christ. While Peter wrote that those ‘in Christ’ are an integral part of a spiritual house, they are not only ‘lively stones’ but also ‘an holy priesthood’ in the spiritual temple of the New Covenant Age. Rev 21:3 KJV And I heard a great voice out of heaven saying, Behold, the tabernacle of God is with men, and he will dwell with them, and they shall be his people, and God himself shall be with them, and be their God. John also alluded to Ezekiel 37:27 in the Revelation, and thereby confirmed the temple of the New Covenant was the fulfillment of Ezekiel’s prophecy. Joh 2:20-21 KJV Then said the Jews, Forty and six years was this temple in building, and wilt thou rear it up in three days? 21 But he spake of the temple of his body. Heb 8:1-2 KJV Now of the things which we have spoken this is the sum: We have such a high priest, who is set on the right hand of the throne of the Majesty in the heavens; 2 A minister of the sanctuary, and of the true tabernacle, which the Lord pitched, and not man. The tabernacle in the wilderness with the pillar of cloud was evidence of God dwelling amongst His Old Covenant people. This glorious manifestation was but a type and foreshadow of the greater glory to come, the Lord Jesus Christ and His New Covenant people being the antitype. Joh 4:20-24 KJV Our fathers worshipped in this mountain; and ye say, that in Jerusalem is the place where men ought to worship. 21 Jesus saith unto her, Woman believe me, the hour cometh, when ye shall neither in this mountain, nor yet at Jerusalem, worship the Father. 22 Ye worship ye know not what: we know what we worship: for salvation is of the Jews. 23 But the hour cometh, and now is, when the true worshippers shall worship the Father in spirit and in truth: for the Father seeketh such to worship him. 24 God is a Spirit: and they that worship him must worship him in spirit and in truth. During His conversation with the woman of Samaria, Jesus revealed the time had come when God’s people would worship neither on Mount Gerizim nor in the temple at Jerusalem, but ‘in spirit and in truth’. Surely, this nullifies Dispensationalism’s concept of a millennium temple. ‘the hour cometh, and now is’ This was a statement of imminence, not a prophetic word for those living thousands of years in the future. Adam Clarke’s comment is correct, but why did he not apply the same criterion to the Scriptures that declare an imminent return of Christ? Rev 22:6 KJV And he said unto me, These sayings are faithful and true: and the Lord God of the holy prophets sent his angel to shew unto his servants the things which must shortly be done. ‘the things which must shortly be done’ The timeline when worship in the temple would end was AD 70. The destruction of the temple symbolised the end of the Old Covenant Age and the inauguration of the New. Despite the five statements of imminence in Revelation 22, Dispensationalism, the theory renown for taking the Scriptures literally, repudiates these. Revelation 22:6 ‘These sayings are faithful and true – See the preceding chapter, Rev_21:5. From this verse to the end of the chapter is reckoned the epilogue of this book. 1. The angel affirms the truth of all that had been spoken, Rev_22:6-11. 2. Jesus Christ confirms what has been affirmed, and pledges himself for the fulfillment of all the prophecies contained in it, Rev_22:12-17. 3. John cautions his readers against adding or diminishing, and concludes with the apostolical blessing, Rev_22:18-21. ‘God in heaven alone knows’ Adam Clarke made an honest assessment of Revelation 22:6, but with a surprising ambivalence. His reticence to affirm the clearly defined imminent time statements of Jesus repeated on five occasions in chapter 22, is a further example of approaching Scripture from a futurist presupposition. It is interesting to note he had no hesitation in implementing the imminence factor in his comment on John 4:21 in the previous segment. Our understanding of Eschatology is vitally important because it influences our whole outlook and approach to the things appertaining to the Kingdom of God. ‘the Lord God Almighty and the Lamb are the temple of it’ On the premise that Jesus has made all things new, why do many believers yield to Dispensationalism’s ‘end times’ theory which entangles them in a system that postulates a return to the ‘old’ that has passed away?